El crecimiento de las redes sociales nos obliga a ponernos las pilas y expandir la presencia de Cuando era Chamo en más redes sociales. En esta ocasión hemos decidio crear un perfil en Twitter de Cuando era Chamo para acercanos cada vez más a nuestros usuarios. ¿Qué es Twitter y por qué es tan atractivo? Es lo que se conoce como un microblog. Permite tener, gratis, una página personal. Basta con elegir un nombre, una contraseña y anotar un e-mail válido. Con esto se accederá a la página personal. Allí, una caja de diálogo invita a contar qué estamos haciendo en 140 caracteres. Nuestra intención es tener una comunicación más directa con el fin de mantener siempre actualizados a los fans de Cuando era Chamo que constantemente estan disfrutando de los recuerdos que publicamos. 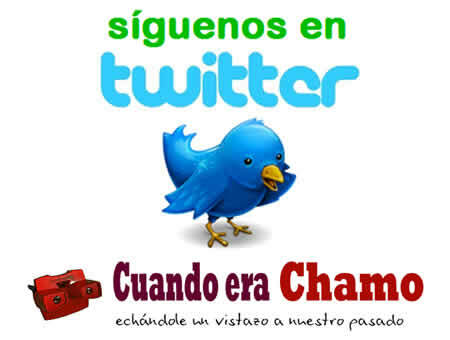 ¿Qué ventajas tiene ser follower en Twitter de Cuando era Chamo? Por un lado podrán estar actualizados de los últimos artículos subidos al blog y por otro lado podrán ver enlaces a excelentes artículos nostálgicos publicados en otros sitios web de recuerdos. Igualmente aquellos usuarios que navegando por internet vean artículos interesantes retro, nos pueden enviar un mensaje directo a la cuenta de Twitter y con gusto lo publicaremos en esta plataforma. De esta manera hacemos que los contenidos de Cuando era Chamo sean más de los usuarios. Esperamos pues, que la experiencia sea positiva y que este blog se convierta en una comunidad cada vez mayor. También vamos a pegar en este blog una caja con las últimas actualizaciones de twitter de Cuando era Chamo. Genial que ya esten en Twitter… asi estare pendiente de sus publicaciones. I’d come to concede with you on this. Which is not something I typically do! I really like reading a post that will make people think. Also, thanks for allowing me to comment! Youre so right. Im there with you. Your blog is absolutely worth a read if anybody comes across it. Im lucky I did because now Ive acquired a whole new view of this. I didnt realise that this issue was so important and so universal. You unquestionably put it in perspective for me. I am impressed, I have to say. Very rarely do I see a blog that is both educative and entertaining, and let me tell you, you’ve hit the nail on the head. Your post is important; the matter is something that not a lot of people are speaking intelligently about. I am really happy that I stumbled across this in my search for something relating to it. This website is awesome. I constantly come across new things & different the following. Thank you for that information. Had to sort through a lot of comments, however I absolutely liked the post. It seemed to be very educational to me and I am certain to all the commenters here! I find it to be always great when you can not only be informed, but also entertained! I’m sure you had fun writing this post. facts the reality of the issue. delighted you wrote, i love to read opinions that make sense and are beneficial anyway. I have study a few of the articles on your website these few days, and I really like your way of blogging. I bookmarked it to my favorites site list and will be checking back soon. Please check out my internet site too and let me know your opinion. provides a realistic look at the issue. delighted you wrote, i love to read articles that tell more of the story, they are more worthwhile in nature. Damn, awesome website. I came across this on Bing, and I am extremely happy that I did. I will definately be revisiting here more often. Wish I could add to the conversation and bring a bit more to the post, but am just taking in as much info as I can at the moment. Can I just say nice to read a comfort to discover somebody who really realizes what they are sharing on the internet. You definitely get experience to take a major issue to light and enable it to be critical. More people should study this particular and understand this particular aspect of the story. I cant believe you aren’t more popular because you essentially have the gift. Thanks for taking the time to discuss this, I feel strongly about it and really like finding out extra on this topic. If possible, as you acquire experience, would you mind updating your blog with more information and facts? It’s very helpful for me. hello there and thank you for your info – I’ve certainly picked up anything new from right here. I did however expertise a few technical issues using this site, since I experienced to reload the web site lots of times previous to I could get it to load correctly. I had been wondering if your web hosting is OK? Not that I’m complaining, but sluggish loading instances times will often affect your placement in google and could damage your quality score if ads and marketing with Adwords. Well I am adding this RSS to my e-mail and can look out for much more of your respective exciting content. Ensure that you update this again very soon..